When you think about your oral health, your teeth and gums probably come to mind. What many people overlook is the health of their tongue. This major organ in your mouth harbors a large amount of bacteria that if not properly cleaned, could put your oral and physical health at risk. A quick look at your tongue can give our dentists a good indication of your oral health, believe it or not. 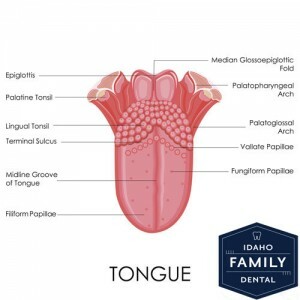 A tongue that is not smooth and generally pink in color is an indication that something is amiss in your mouth or with your oral health – that is the imminent role that your tongue plays in your overall health. Is your tongue healthy? As a normal part of your two minute brushing, you should be caring for your tongue. This includes brushing it from back to front several times as the last step in the brushing process. This gives the germs a good chance at leaving your mouth rather than being forced further down your throat, putting you at risk for infections in other parts of your body. You can brush your tongue with either your toothbrush or a tongue scraper, whatever you are most comfortable using and whichever tool does not cause you to gag. As a final step after brushing your teeth and your tongue, you should rinse your mouth out with warm water. Rinsing, swishing and gargling will remove any remaining particles and bacteria from your mouth, helping you to keep your mouth clean and healthy. Worried about your tongue being healthy? Schedule an exam today or call us for more information.